One of the underrated joys of owning a website is getting to see how people find your site using search engines like Google or Bing. At The Changeover, we use Google Analytics, which allows us to see which search term was used to eventually find our site. The results are sometimes amazing. 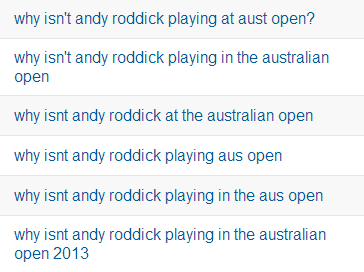 During the Australian Open, we had a boatload of search terms that led people to our site – over 1200! I hope they liked what they found! Or at least I hope all those curious individuals got an answer to their pertinent questions. Without further ado, I present you a curated list of search terms used during the Australian Open fortnight to reach our site, organized in a quasi thematically. Enjoy! Lindsay wrote a fabulous piece on him. And Amy chronicled via GIFs how Monfils famously attempted to serve out a match at the Australian Open. What fascinates me about it is that someone typed that in a search engine trying to get an answer. Wouldn’t it be easier to do an image search on Wozniacki and figure out yourself? He retired. Last year. Lindsay wrote about it. @juanjo_sports I feel like all of these are my fault. Maybe whoever searched for “tomic’s a wanker” didn’t get his/her answer through that search query, and then decided to correct the spelling for the second one. Not happening anytime soon, whoever searched for that. Neither Amy, Lindsay nor I got to go Down Under, but we did learn a few things from watching the Australian Open on TV! I’m surprised the Australian Open or ESPN haven’t made this a slogan for their US coverage. It could even be a t-shirt. This is one of my favorite search queries. 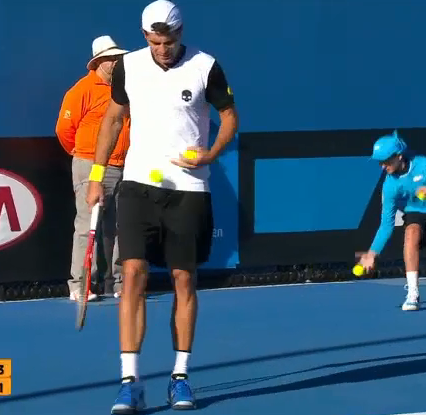 It’s clearly someone who just started watching tennis, and probably was wondering why everybody was a) wearing yellow stuff in Australia and b) why people used the same outfits day in and day out. I really hope that this person found the song he/she was looking for. It’s so annoying when you want to find a song you don’t know the name to. Hopefully the Changeover Music archives helped, although I’m not holding my breath on that one. Safin is in Russia! Doing political stuff, apparently. Though I’m not sure about that one. I don’t know, to be honest. You’d have to ask him. I’m not sure what to say to that one. As Lindsay noted, this is still a problem. I don’t know, but I love hearing him say the word “player.” It’s the best. He’s ranked No. 4 in the world right now, but I know what you mean, anonymous person. This one came after Djokovic’s demolition of Ferrer in the semifinals. I’d be willing to guess that it was Ferrer himself googling that. Well, the man is 31 years old and has played more than 1000 matches on tour … what did you expect? A lot of money, I guess. Or at least I hope. Well, that’s a new one. I guess. Next Entry: Holy Moly: Switzerland and Czech Republic Play 7 Hour Davis Cup Doubles Match. Twitter Reacts.